at NUHM UPHC office of kolkata city @ Institute of Urban Management Alakapur, 36C, Ballygunge Circular Road, Kolkata-700019 along with all required documents. 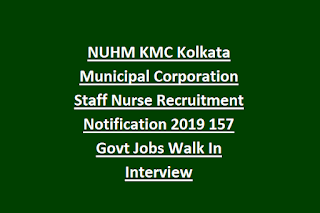 There are total 157 Staff Nurses vacancies available in this current NUHM UPHC of Kolkata City recruitment. Selection for these Staff Nurses vacancies will be held conducted through marks secured in qualifying examination. This recruitment is strictly based Merit only and these vacancies are contract based. This KMC recruitment is 6 months contract based. Contract will be renewed for every six months. For more details regarding this KMC Staff Nurse Vacancies age limits, educational qualifications, pay scale and more information see the details furnished below. There are total 157 Staff Nurse vacancies available in this current recruitment of KMC. As on 01-01-2019 Upper age limit is 64 years for all candidates. The candidates should have completed GNM training or BSc nursing or MSc Nursing from a recognized institute or university by Indian Nursing Council or West Bengal Nursing Council. Candidate must have registered with West Bengal Nursing Council. 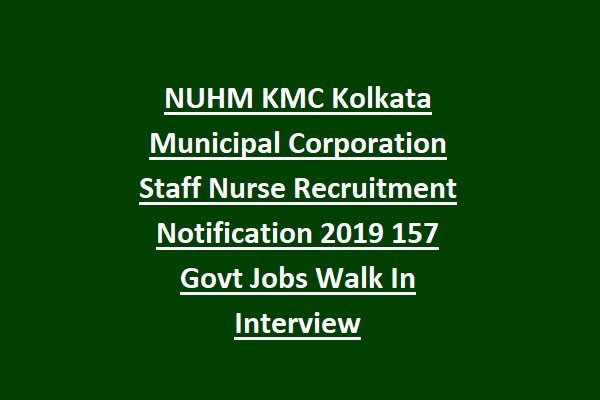 Selection for this recruitment of KMC NUHM Staff Nurse will be held based on marks secured in Educational qualifications only. Interested and eligible candidates can download the application form from KMC official website @km.gov.in. And complete the form neatly and attend the walk in interview at the Institute of Urban Management Alakapur, 36C, Ballygunge Circular Road, Kolkata-700019 along with all required documents and educational qualifications on 18-03-2019 by 10:30 Am.